The FDF100VD2 vertical floor standing model from Mitsubishi comprises of a floor standing indoor and outdoor unit rated at 10Kw. 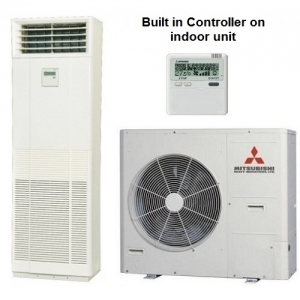 This is a reverse cycle air source heat pump model and can easily switch between heating and cooling as required. We would recommend this model to heat and cool open plan offices up to a 90 square metres or other such areas. The system comprises the indoor and outdoor unit with built in fully programmable 7 day controller / timer on the indoor unit.